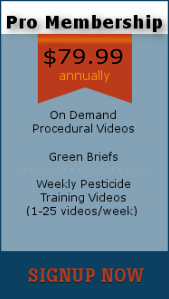 We would like to offer to our visitors, the Green Applicator Weekly Pesticide Training Video Training Series for FREE. These 10 minute videos help business owners conduct their required, weekly lunchbox, tailgate, or pesticide safety meetings. It helps individuals become better informed when it comes to pesticide use and safety. IF you want to use your lawn clippings as feed, we want you to be safe while applying the different lawn products required for your trade. Videos can be watched on a computer, tablet, iPhone, or Android device at your leisure throughout each week.